These fun-to-make holiday cookies are shaped like candy canes, baked, frosted and then sprinkled with real crushed candy canes. For Cookies: Combine butter, sugar, salt and flavoring into large electric mixer bowl and beat until fluffy. Stir in almonds and flour until well blended. Roll a heaping tablespoon of dough into a rope and form into a candy cane shape. Place on well-buttered or parchment-lined baking sheet and repeat using all of the dough to make 20 to 24 cookies. Bake until slightly browned, 15 to 17 minutes. Cool on pan until slightly firm, then carefully remove to a wire rack and cool completely. For icing: Stir powdered sugar and milk together. Add food coloring, if desired. 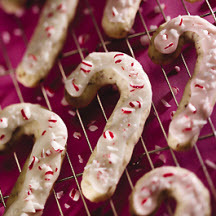 Drizzle on cookies and sprinkle with crushed candy canes.